Do you love your plan to get yourself moving, get in your steps, burn some calories, bump up your energy level, what have you? Or is it pure torture and drudgery? Are you in the category of folks who claim, “I don’t have time,” when asked if you get any exercise? Here’s the deal: if you aren’t having fun -–at least to some degree— you won’t make it part of your life. Motivation and inspiration only last so long. Excuses and very convincing stories are easy to come by. Whatever you do, it has to be convenient and enjoyable. I can feel some of you rolling your eyes; you are the ones doing killer workouts several times a week and wondering if you will survive the next one. Honesty time—you enjoy these on some level or you would not keep going back for more. There is something addictive and magical about it, whether you go out and run miles in the cold and rain or do CrossFit. If you recall one of my recent blogs, my friend Carol has changed many of her habits so that she can keep dancing. Zumba, belly dancing, and ballet fit keep her moving and she enjoys them. If anyone suggested she start running or join a gym, she’d never get off the couch. Well, except to walk her dog. Movement is beneficial for our overall health and well-being. You may or may not be a gym person. It doesn’t matter, as long as you figure out what works for you. Here’s a bit of news that may surprise you, however. According to various studies, exercise ALONE does not affect fat or weight loss. Exercise IN COMBINATION with nutritional adjustments is the secret formula. If you feel stuck with your current fitness routine, the weight or fat percentage needle isn’t moving, or you’re bored, then it’s time to seek out something new. Challenge yourself to expand your horizons and see what fitness adventures await, combining movement and food that work for YOU. As for me, I look forward to my various group workouts. Here’s a surprise: I love the social aspect of group activities. I do a Total Body Conditioning class once a week that pushes me to the place of “I hope I survive this.” The energy in the room is through the roof and we would all be disappointed and feel cheated with anything less than extreme. Thank you, Estelle! We keep coming back. Perhaps you have your meals down when it comes to the nutritional component of the fitness puzzle, yet you struggle with snacks. Who doesn’t love snacks that taste great, provide good energy and don’t mess up your fitness goals? Oh, and did I mention EASY? If snacking is a challenge for you, join me for my upcoming Kitchen Coaching session: Let’s Do Snacks. We’ll have some fun! One of the biggest issues families face today is mealtime—together. Lots of schedules, directions, agendas, and taste preferences. The idea of gathering for a home-cooked meal may even seem hopeless, which then leads to more eating out. Eating in is typically healthier, more economical and often tastier than the alternative. Here are some ideas to make meals at home a bit simpler. Even if you aren’t all together at the same time, most of these are fine as a late plate. When you have the opportunity to make meatloaf, casserole, soup, stew, anything, make extra for another meal. The leftovers can be frozen for another crazy day or eaten the next day or so for lunches and snacks. By doing this, you save time, energy, and aggravation—AND, you won’t dirty as many dishes to reheat the leftovers. Check out the specials in the meat department. I recently picked up some pork chops that were seasoned with panko breadcrumbs, sundried tomatoes and other seasonings. They were reduced to unload them that day. I cooked rice and tossed a salad together with greens, tomatoes and other veggies, whiled the chops were on the grill. We had a tasty meal for very little money and effort in about half an hour. Sweet! Remember those tasty rotisserie chickens that just about every grocery store carries these days. I found myself in a quandary about dinner this past week and needed to stop at the store to pick up chocolate milk for hubby. (It’s his special treat.) We hadn’t eaten dinner, it was getting late, I didn’t care to eat out and we were hungry—on the verge of hangry. (Combo of hungry and angry which can also be referred to as fussy.) I snatched up one of those chickens and it was perfect. You could add it to a salad, make a wrap, or add some vegetables for a complete meal. Any type of burger—veggie burger, hamburger, pork burger, chicken burger, turkey burger—cooks very fast and makes a great lunch the next day. Eggs cooked to your liking, along with sautéed vegetables are good anytime of day. When you are shopping, pick up the vegetables that are on special that week and be sure to get a variety of colors. Chop them up in similar size pieces and sauté in olive oil. This is quicker than roasting and more flavorful than steamed. I like a combo of potatoes (sweet and golden Yukon), mulit- colored sweet peppers, onions, Brussels sprouts, carrots. If your family eats fish, this cooks quicker than just about anything. It is one of those foods that I don’t make extra of, since it’s not that great leftover. The exception is salmon, which is good cold or a bit warmed on greens. Pasta is quick, easy, and most people like it. For those of you who avoid gluten, you might try quinoa pasta or brown rice pasta. (There are bean pastas, and those are not my favorite.) Add a sauce you enjoy and browned ground meat or poultry. Or, add the sautéed vegetables and skip the sauce. Pictured is last night’s meal. I used chicken sausage that I added along with the veggies. Again, this took less than 30 minutes and was delicious! Keep in mind that the meal doesn’t have to be perfect to provide good nutrition and bring your family together. Celebrate any success you have in getting your family around the table, even if it’s for hot dogs—organic, of course! The main article was all about Northwest Indiana’s best-selling donuts. Now, my rule of “only eat it if it’s amazing” applies to donuts as it does any “non-compliant” food. I enjoy an amazing donut as much as anyone. At this point in my life, however, eating donuts in excess are not in my best interest. I could have gotten away with it back in high school when I was on the swim team. Long gone are those days. Bye-bye now. Here is a “treat” that will add a bit of spice to your fall mornings. 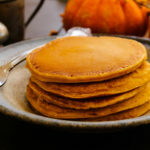 These Gluten Free Pumpkin Pancakes help fill the craving for comfort food, without added sugar and gluten. The almond butter and eggs in them provide protein to start off your day. Pumpkin may be classified as a fruit or a vegetable, depending on whether you ask a botanist or culinary expert. Whatever you choose to call it, pumpkin offers vitamin A, fiber and a number of other vitamins and minerals. I sometimes give a spoonful of canned pumpkin to my Sophie dog. She loves it and it aids with proper digestion. These pancakes are not limited to breakfast. They make a tasty snack, even cold. I make a batch and they keep for several days in the fridge. Oh, and for the record, my favorite donut when I choose to indulge is the cake variety with chocolate frosting. YUM! Happy pancaking.